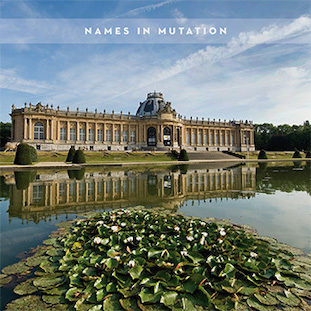 Names In Mutation is an archive CD combining two side-projects by Belgian cold wave group The Names, best known for their work on Factory, Factory Benelux and Les Disques du Crépuscule. The first three tracks were originally released as a solo cassette single by guitarist Marc Deprez in April 1981. Somewhat in the style of The Durutti Column, the K7 was issued in a limited edition of just 100 copies with hand-coloured inserts. A video clip for Balade à Tervueren was also included on the Crépuscule compilation video Umbrellas in the Sun (TWI 099), filmed in the picturesque grounds of the Musée Royal de l'Afrique Centrale in Tervuren. Tracks from Marc's cassette were also used as interval music on the Crépuscule package tour Dialogue North-South in February 1982. On this tour The Names played as Names In Mutation, performing only the darker 'night' side of their acclaimed Swimming album, along with short instrumental Music for Someone and an absurdist introduction by emcee Wally van Middendorp, of Minny Pops. The set on this CD was recorded at Brussels Beursschouwburg on 3 February 1982. In Mutation is available to buy now via Les Disques du Crépuscule Mailorder.